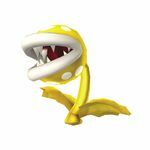 Gold Piranha Plants are golden varieties of Piranha Plants appearing in New Super Mario Bros. 2. Piranha Plants become Gold Piranha Plants when the player touches a Gold Ring. They release coins from the pipes where they are in when defeated. Aside from that, they can be defeated the same way like ordinary Piranha Plants. Gold Piranha Plants reappear in Mario Party 10 in the minigame Pipe Sniper. In this minigame, they grant the player three points if players shoot them with orbs, while regular Piranha Plants give one point. Gold Piranha Plants appear in Mario Party: Star Rush in the minigame, Piranha Plantemonium. If players shoot them, they are worth three points, more than the regular Piranha Plants' one point. Large Gold Piranha Plants with a health bar can occasionally appear. They require several hits to take down, and the player who defeats it earns ten points. In Super Smash Bros. Ultimate, Gold Piranha Plants (referred to as Gold Piranhas) are mentioned briefly by Viridi during Palutena's Guidance dialogue for Piranha Plant. A golden and shiny Piranha Plant. "Unlike standard Piranha Plants, these golden ones have a way of making the fight worth your while." This page was last edited on February 13, 2019, at 17:29.